Modular Protective Barrier | Dock Door Systems Inc. 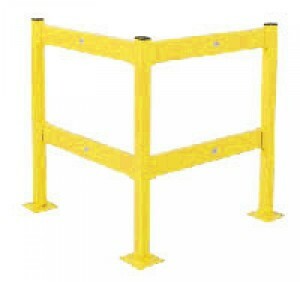 Available in 20" single or 42" double post design with guard rail lengths up to 10'. Bluff's Modular Protective Barrier Guard Rail System offers an inexpensive and simple answer to solving very difficult safety barrier protection problems in your warehouse or plant. Protect personnel, machinery, in-plant offices, electrical panels, tool cribs, conveyors, finished products, receiving docks, cooling equipment and may other areas in your plant by utilizing Bluff's economical Modular Protective Barrier guardrail system. Light-Weight guard rails for easy lifting. Simple to install, add-on or to custom size guardrail lengths in the field. The "lift out" design allows temporary access to specific areas quickly and safely...No time consuming or expensive re-installation required. 42" double guard rail meets OSHA guidelines for fall protection. High quality safety yellow enamel paint finish. Optional floor rail is positioned 2" off ground to deter pallet jack entry.